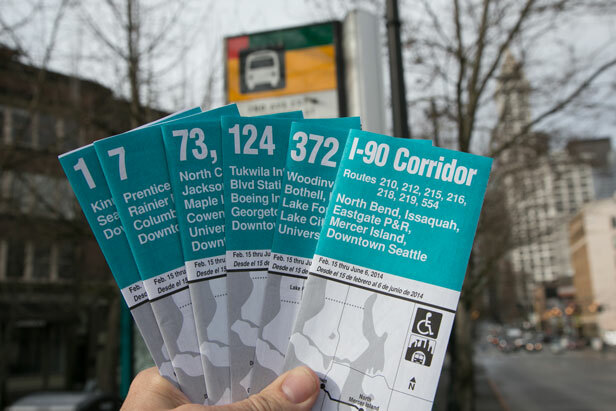 In just a few days, Rapid Ride E Line will replace Route 358 along an 11-mile stretch of Aurora Avenue North – marking the arrival of King County Metro Transit’s fifth RapidRide line. Service starts Saturday, Feb. 15 as part of Metro’s winter service change. Route 358 is Metro’s second highest ridership route, delivering 12,000 rides each weekday. With the addition of the E Line, ridership is projected to grow by 50 percent to 5.4 million annual rides within the next five years. Over $25 million in FTA grants helped pay for new RapidRide coaches, passenger and pedestrian improvements, and Business Access and Transit (BAT) lanes. The grant was key in helping to launch the new line considering Metro’s financial situation. Without additional tools, Metro plans to cut up to 17 percent of its service beginning this fall. Launch of the E Line coincides with Metro’s three-times-a-year service change. New teal timetables will be available in coming days and route and schedule changes are posted online. Metro’s online Trip Planner is now updated for riders who want to plan a trip after the Feb. 15 service change. Changes are planned to northbound routes 17X, 18X, 37, 28, and routes 50, 60, 64 and 65. Information about a temporary two-month bus stop construction closure at Third Avenue and Pine Street in Seattle also will be posted online in coming days. The distinguishing features of RapidRide are frequent all-day service, passenger amenities such as well-lit shelters, real-time “next bus” signs, off-board ORCA card payment, hybrid-electric buses with three doors and free Wi-Fi. Buses will come often, operating every 5 to 15 minutes throughout the day. The Route 358 already runs frequently, but one or two trips per hour will be added throughout the day, including late night and early morning. These additions will allow the E Line to operate as a 24-hour service. The Aurora Avenue corridor will see an overall 25 percent increase in service when the E Line is introduced. Look for shorter bus trips along Aurora Avenue. More than 18 miles of designated north and southbound BAT lanes have already improved travel time by getting buses through congested areas. The initial E Line schedule will shave another one to nine minutes off each trip, depending on time of day and how far a rider is traveling. Off-board ORCA card readers, the use of bus rear doors and traffic signal priority will all work together to speed boarding and get buses through intersections faster – improvements that will achieve even more travel time savings in the coming months. Fare enforcement, on-board cameras and improved lighting will offer a sense of added security. As with other RapidRide lines, fare enforcement officers will check to confirm fare payment and provide customer service, as needed. All RapidRide coaches will come equipped with cameras for added security, increasing the overall number of camera coaches in Metro’s fleet. Riders will see improved lighting at all 50 new RapidRide shelters along Aurora Ave. And riders waiting at bus shelters will be more easily seen at night thanks to newly installed stop request lights. Red and yellow RapidRide buses include features needed as demand for bus service grows along the corridor. The 60-foot low-floor articulated buses will have three doors and fewer seats so riders can get on and off the bus more quickly. Additional interior features will make it more comfortable to stand when the bus is crowded. A strapless wheelchair restraint system will enable riders with wheelchairs to board quickly and easily. The launch of the E Line moves Metro closer to completing its initial promise to bring faster, more reliable service to some of the county’s most congested travel corridors as part of its 2006 Transit Now initiative. The F Line, Metro’s sixth RapidRide line, begins service between Burien and Renton in June. Overall customer satisfaction with RapidRide remains high with the four existing lines drawing an average 78 percent satisfaction rate. And ridership continues to climb. Combined ridership on existing RapidRide lines has grown 36 percent, outpacing projections. Metro delivers about 31,000 RapidRide trips each weekday. You don’t mention any intent to raise the price of the ride, so I’m curious why your staff are now saying this bus is a 2-zone price.